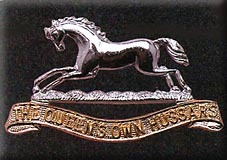 The Queen's Own Hussars were formed from the amalgamation of the 3rd King's Own Hussars and the 7th Queen's Own Hussars at Tidworth on 3rd November 1958. The regiment remained at Tidworth, as the Armoured Regiment of the 3rd Division, until July 1960. C squadron was detached to Aden from Feb to Dec 1960 and A Squadron was sent to Warminster School of Infantry as a demonstration unit. They were reunited as the Armoured Regiment of 6th Infantry Brigade Group in Munster, Germany until July 1962 when they moved to Detmold for the next two and a half year to serve in the 20th Armoured Brigade. In Feb 1965, A Squadron was detached for service in Berlin while the remainder of the regiment returned to the UK to be stationed at Catterick, working as a training regiment. The year 1967 was a busy and eventful year for the QOH. In February they were converted to the role of Armoured Reconnaissance Regiment. They had to relinquish their formidable Mark XIII Centurion tanks and re-train on Saladins and Ferret scout cars, at Maresfield in East Sussex. In July 1967 they were sent out on active service to Aden, or Crater, on the southern tip of Arabia, to provide support for the Argyll and Sutherland Highlanders who had already been there a few weeks. The whole regiment was sent to the Arabian Peninsula but B Squadron went to Sharjah. The QOH were now recruiting in the West Midlands so many of the troopers were from Birmingham, and the sudden removal of these men to the land of the Queen of Sheba's Wells was a cause for great excitement and a bit of a culture shock. The work was mostly within the city, patrolling one hour on and one hour off for 15 hours a day. The different local factions had to be kept apart; the NLF and FLOSY (Front for the Liberation of South Yemen) were the main protagonists in the struggle for independence. Later, the area of operation extended to Maalla and the waterfront in support of 45 Commando, Royal Marines. During their time there men of the regiment won an MC and 6 mentions in despatches. They stayed there until Nov 1967 when they were withdrawn, some by air, some on HMS Intrepid to Dubai, and some via the Cape on RFA Sir Galahad. B Squadron stayed in Sharjah until March 1968, then went to Cyprus with the United Nations. The regiment had converted to an Armoured Regiment at Hohne in 1970 and were back in the 7th Armoured Brigade, but in February 1972 the headquarters of the regiment, with Major Venner in command, and A Squadron were sent to South Armagh, deployed in the light reconnaissance role. RHQ did not command A Squadron but was in charge of sub-units of the Scots Greys, 7th RHA and 1st Devon and Dorsets. The tour of duty was quiet but successful and did much to reassure local communities in places like Newry. They returned to BAOR in May 1972. "It was my good fortune to be the Squadron Leader of A Squadron in south-west Belfast, where we experienced what was probably the most interesting and action-packed tour of any Queen's Own Hussar Squadron in Ulster's current troubled times. In June 1973, after two hectic months of learning the rigours and skills of the infantry soldier, A Squadron relieved two companies of the 1st Battalion Cheshire Regiment and set up their operational base in the bombed-out/burned-out ruins of the Woodburn Hotel, Suffolk, Belfast. The squadron's peace-keeping tasks included policing an ultra-sensitive Protestant/Catholic interface, to which the RUC could not, at that time, be effective (or indeed present), patrolling in an endeavour to reassure, and generally getting to know the people. The area was relatively small with the result that the soldiers quickly learned who was who, who could be trusted and who could not. The intimidation aspect was very serious, for at this time the Catholic community were endeavouring to set up homes in the area, whilst the Protestants sought to keep them out. Both sides deployed much the same tactics, ie they used their thug elements to scare the wits out of the minority groups, particularly in the mixed areas of the local housing estates, (not a difficult task if blind shooting through doors and setting house on fire are the tools of persuasion). This was normally done as a prelude to illegal squatting, from which in Belfast at that time followed the right to the legal occupancy of the houses concerned. It presented a difficult problem, nonetheless A Squadron found an answer. This was to move men of the squadron into the vacant houses as they became empty and before the illegals could get there. 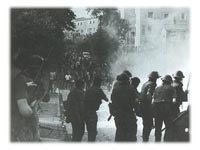 Such occupation by the soldiers lasted until the housing executive could move legal occupiers into the houses in question. It stretched manpower resources at times but it worked most successfully." The regiment were in Bovingdon in September 1974 although B Squadron were at Warminster School of Infantry. In 1976 the QOH went to Detmold BAOR, but a year later returned to Northern Ireland, again in the infantry role but in County Armargh. The CO was now Lt-Col Greenwood who had commanded A Squadron in Belfast in 1973. He was in command of three QOH squadrons, a squadron of Life Guards and a company of 1st Black Watch. The tour of duty lasted from May to September and involved foot patrols, helicopter operations, and escorting close observations tasks which required discretion and patience. Intelligence work was part and parcel of the soldiering in the 550 square mile area where insurgents from the Republic had to be prevented from moving freely in Armargh. The regiment prided themselves that throughout the 1977 tour, and the 1973 tour, there were no negligent discharges. The regiment completed a fourth 4 month tour of duty in Ulster from June to October 1979. Col Greenwood had been replaced as CO by Lt-Col HM Sandars. Operating in Belfast, A Squadron returned to their old haunt at the Woodburn Hotel, B Squadron was at Glasmullen and HQ Squadron Echelon at Musgrave Park. The former British Honduras in Central America had been granted independence from Britain in 1981 but was in a state of unrest brought about by the long dispute with neighbouring Guatemala. British troops had been kept there to keep the peace and a Recce Troop was provided by the Queen's Own Hussars from Sep 1983 to Mar 1984 and from Sep 1984 to Mar 1985. The regiment was based at Hohne in Germany from 1985 to 1993 as part of 22nd Armoured Brigade. During that time detachments were sent to be part of the Guard Force at the Maze Prison in Northern Ireland. A Squadron and part of D Squadron were sent for duty from Jan to Mar 1987, and D Squadron sent again in 1992. The regiment was divided into two for service in Cyprus in Dec 1990. A and D Squadrons were sent to Dhekelia garrison in the south east of the island, and C and B Squadron were detached to the UN forces on the Green Line between the Turkish occupied north and the southern Greek Cypriot Republic. They returned to BAOR in June 1991 but a year later B Squadron was posted to the Sovereign's Base Area at Episkopi near Limassol. In July 1993 advanced party elements were moved from Hohne to Fallingbostel but the actual amalgamation took place in September that year to join the Queen's Own Hussars to the Queen's Royal Irish Hussars. The QRIH had been formed only days before the QOH, on the 24th Oct 1958, from the 4th (Queen's Own) Hussars and the 8th (King's Royal Irish) Hussars. The amalgamation parade took place at Fallingbostel on 1st Sept and the new regiment was titled The Queen's Royal Hussars.